People who can avoid temptation stand to make a lot more money on Amazon. Adam Hudson explains why. This post is an excerpt from the book Primed: Your Guide To Building An Amazing Business On Amazon. 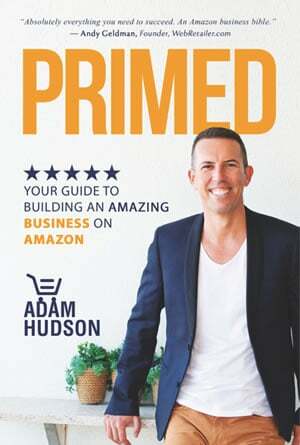 Primed is available from Amazon.com and Amazon.co.uk, and its author Adam Hudson was profiled by Web Retailer in October 2016. I want to share with you a fascinating study done in 1970 that put a group of 5-year-old kids into an observation room where each was presented with one marshmallow on a plate. The children were told that they could either eat the marshmallow now, or they could wait 20 minutes and they would receive a whole bag of marshmallows. Of those tested, only a few waited the 20 minutes. The researchers then tracked those children for the next 40 years, studying their professional and financial progress. Using no other metric other than their ability to wait 20 minutes for a bag of marshmallows when they were 5 years old, those that had waited the 20 minutes became far more successful financially. For most everyday people who will be starting an Amazon business with modest financial means but a desire for time-free income, the same principle of delayed gratification will need to apply. Because you make money on Amazon in only one way – selling products. The more products you have, the more money-making potential you have. The fewer products you have, the less money-making potential you have. In simple terms, your income is directly tied to how much inventory you have, and how much inventory you have will be tied to how much capital you have. Sadly, very few Amazon gurus make this point clearly. Instead, they keep you focused on how much money you can make with little mention of the underlying investment in inventory that is required. Much like the game of monopoly, each product you have on Amazon is like a house. The more houses you have, the more income you make. Every now and then, you’ll launch a product that becomes a hotel. These are hit products people love and they are visited more often than your houses. These “hotel products” earn way more than your average “house product” on the Amazon monopoly board. That being said, houses and hotels cost money to buy, so if you have limited cash to start with, then you’re going to have to be patient, follow Jeff Bezos’ strategy, and reinvest what you earn into your business. Over time, you’ll build a nice little portfolio of houses and hotels and you’ll be able to retire from your Amazon income. So here’s my “Velocity Retailing” formula to help get your head around this. OK, let’s begin with the second variable, “Return”. I have a saying that goes like this. In business, turnover is irrelevant. It’s the left over I’m interested in. For some strange reason, many experts are always talking about how much “revenue” they’re doing on Amazon, but revenue numbers can be very misleading. What’s the point of doing $1,000,000 in revenue if your costs are $1,000,001? It’s somewhat important to know that second part right? When I say, “return”, I am referring to the percentage return you make on the capital you invested. For example, if you invest $1 into a product that sells on Amazon and you get $1.30 back after paying for all the costs, then your return is 30%. $0.30 is 30% of $1 so your return is 30%. The next piece of the formula is “Rotations”. Rotations relates to how many times a year you can sell that inventory and realize that return. For example, if you order 1,000 frying pans for $10,000, how quickly will you be able to get your money back and order them again? Can you rotate 1,000 frying pans once, twice or even three times a year? As you’ll see in a moment, the answer to this question will have a profound impact on the amount of money you’ll make as an Amazon seller. The last piece is “Income”. This is simply how much money you’ll actually make from your Amazon business – after ALL expenses. So let me give you a practical example, and then we will dive deeper into some of the variables and how they can greatly impact your spendable income. Jake is a stay-at-home dad raising three beautiful kids, while his wife Sally continues to run the graphic design business they started 5 years before having a family. They both have an eye for design and they spot a gap in the market for high-end kids’ dinner plates. In total, they want to invest $10,000 into starting an Amazon business. They’ve done their research and found a supplier in China who will put their own designs onto the plates they want, at a price of $5 for a set of four plates. We will refer to this $10 total as “The Cost Of Goods Sold”, or “COGS” for short. It represents the total cost of getting your complete product made and then shipped all the way to Amazon’s warehouse and ready for sale. Please note these costs are for demonstration purposes only. Different types of products attract different import duties depending on what they are and where they are from. Obviously, freight charges vary widely as well, depending on the size and weight, and where the products come from. For now, though, all I want you to understand is the concept of COGS. So now, Jake and Sally are faced with setting a retail price for their plates on Amazon. When they look at the top listings for similar items, they learn that their competitors are selling four plain white kids’ dinner plates for around $16.99, but theirs have stunning designs and they are packaged and photographed to a much higher standard. They strongly feel that because of these additional touches, they can get $21.99/set. So, how much money will they actually make per set of plates they sell? To figure this out, we need to know the additional costs of selling the plates on Amazon. Here follows a breakdown of what Amazon charges on most items. OK, take a breath; we are almost done with the math! In short, Amazon will be taking $21.99 from the customer. They will retain $7.65/unit for their fees, and they will add the difference to Jake and Sally’s seller account that is distributed to them every two weeks by direct bank transfer. So how much are Jake and Sally actually making? Well, they get $14.34 in income from Amazon and then they have to deduct their COGS ($10). OK, now that might not look too exciting at first pass, but stick with me! To make $4.34, they actually only invested $10 for the unit. $4.34 is 43.4% of the $10 that they risked. To work this out, simply get a calculator and put in 4.34 divided by 10. In short, they earned a 43% return on their money in the time that it took to get the product made and then sold on Amazon. This is what we call a “Rotation”. Remember the formula? If it takes them 6 months to “rotate” those plates, it means they can earn that $4,340 twice a year, all from that same $10,000 in capital. So here’s where it gets really exciting. $4,340 x 2 rotations = $8,680/year income. $8,680/year income from $10,000 invested? That’s a whopping 86.8% return on their money annually! OK – time to hit the pause button because this is truly extraordinary! While most people might think, “Well that’s great, but I can’t live on $8,680/year”, let me highlight something. Warren Buffet, the world’s #1 investor, has averaged about 20% annual return throughout his career. Is it possible that Jake and Sally and their humble dinner plates have just outperformed the world’s best investor? Many people have spent $100,000 or more to setup a traditional small business or franchise, only to find themselves tied into leases, selling their time, watching their lives tick by locked inside a room all day. What if Jake and Sally invested $100,000 and started earning 86.8% annually on that money? That would be $86,800/year and they could be anywhere in the world to earn that income, without needing a lease, an office or any employees! I know you can go to Google and find a million stories of people who are apparently making far more money on Amazon than I am showing you here. And, apparently, with far less capital invested. But now you know the math and how it works, you can easily see the trick they don’t reveal, which is income only comes AFTER you’ve invested money into inventory. Well, this would certainly be one way to get there, but I want to teach you a couple of other things before we explore that question. The point of me teaching you my Velocity Retailing Formula is so that you understand the levers to determine how much money you’ll actually have to spend or reinvest back into your business. Remember the marshmallow test? Jake and Sally could spend that $8,680/year if they wanted, but because they’re smart, and they understand the power of compound growth, they decide that they will reinvest the $8,680 each year into more inventory. Over time (and not a lot of time), things get really interesting. $10,000 becomes $223,572 after five years? So Jake and Sally could have started spending their $8,680/year back in year one (like the kids who couldn’t wait for the bag of marshmallows), or they could reinvest their profits each year and delay their gratification, building a strong inventory base that will produce much more income in the future. Now let’s look at the position they’re in 5 years later. First, their $10,000 investment has turned into an asset (inventory) worth $223,572. That’s a staggering 2,223% growth. But what’s important from a lifestyle point-of-view, is that they now have $223,572 invested into an environment that is producing an 86% return annually. Assuming they simply sell that inventory twice a year and spend all the profit on themselves (no more investing for growth), that’s $192,271/year in income. Not bad from a $10,000 investment five years earlier. If you think that’s amazing, let me show you the best part. There is a very good chance that Jake and Sally are now very close to becoming millionaires and they don’t even know it! You see, what Jake and Sally have really built here is a business. A good business plenty of people would like to buy. Who wouldn’t want to walk into an already built business producing $192,000/year profit while the owners don’t have to be anywhere in particular, tied to a lease, or have a single employee? In my opinion, Jake and Sally could easily get 3 times their annual profit plus the value of their inventory if they decided to sell. If they decide to invest their profit for one more year at 86%, they’re definitely going to reach millionaire status, all from $10,000, some hard work, and a good dose of patience. Can you see why I get frustrated with gurus who feel they have to hype people up and mislead them through the omission of basic math? This is an astounding opportunity without any of that! Now it’s time to cool our heels a little and talk about the reality of this journey. Plain and simple, businesses don’t go in straight lines. First, not all products will earn a 43% return (mine average 39%) but the average across Amazon is probably much lower. In Primed, I teach how to go for premium prices and not compete in low margin niches. That having been said, the return in the Jake and Sally example is just shown for the sake of demonstrating the math principles. Second, sometimes products don’t fire. If you follow my advice, your chance of that happening will be considerably lower. However, in the event you miss the market, you may have to sell out your product and recover your COGS. Unless you’ve done something really wrong, this shouldn’t be hard to do because you’re basically going to be selling your items at wholesale prices to recover your capital. Finally, what wasn’t shown in the example above is the cost to establish a brand and a new product on Amazon. If you are going to create a line of well-packaged and well-branded kids’ dinner plates like the Jake and Sally example, you’ll need a logo, a package design, and awesome photography. These three things could cost $2,000 to have done professionally. This is a one-time investment into your brand and listing, but something to keep in the back of your mind. As you’ll learn, I don’t believe in doing the absolute minimum to start a business. That’s what most people do and it’s the most dangerous place to start, in my opinion. The truth is there are all kinds of variables and things unforeseen that may happen in business. That’s why so few people choose this path. I want to explain why I have the Velocity Retail Formula at all. Sure, it’s a great way to work out what you will actually make from your Amazon business, but there’s another reason as well. Each of these variables, Capital, Return, and Rotations, may have a massive impact on your income. For example, if you have the same capital but tweak the return and/or the rotation frequency even a little, you will increase or decrease your income dramatically. What if, instead of selling heavy, relatively bulky dinner plate sets, they were selling a small and light item that their supplier kept on hand instead of them having to wait for their product to be manufactured each time? Something like golf balls or gardening gloves? This would mean that they wouldn’t have to account for manufacturing time or allow a full month just for the boat to go from China to the U.S. because they could airfreight the goods and have them in three days. By tweaking the number of rotations each year, they would see a dramatic impact on their income, without their 43% return or their capital base changing. So let’s see what happens if they can rotate their $10,000 just one extra time a year, three times instead of twice a year. How does this play out? The return on their $10,000 goes from 86.8% annually to 130.2% annually. The same capital, compounded at the same rate of return, for the same five-year period, but rotated just one extra time a year, and instead of having an inventory base of $223,572 at the end, you have an inventory base of $643,634. One extra rotation and you’re up almost 300%. Even more astounding, if you stop reinvesting at that point, and start spending the 130% return on your higher inventory base, you’re now earning 130% on $643,634. That’s a staggering $836,724 a year. All from $10,000 invested five years earlier. Who knew not eating marshmallows right away could be so profitable? So my point is not that this is normal, easy, or will happen. My point is simply that you understand the impact of what seem like small things compounded over time. Albert was a pretty bright guy and he wasn’t kidding! I encourage you to sit down and use my Velocity Retailing Formula to map out your financial goals and see what you need to make happen in order to live the life that you want. If you have a partner, sit down with them as well. If you’re one of those people who hate numbers and you skipped over this work, then let me be the first to tell you, this isn’t good enough! Business is numbers. If you don’t know your numbers then you are not in business. This kind of deep understanding of fundamentals is what many small business people lack and why so few ever succeed. One of my mentors and favorite authors is Robert Kiyosaki. Robert’s “Rich Dad” series of books educate millions of people on financial literacy, literacy that will change your financial life. These books contain incredibly powerful teachings around money and what it takes to succeed in life and business. When they get their capital back, together with their return, do they keep buying more of the same dinner plates? Surely, they wouldn’t have $200,000 worth of the same dinner plate in stock in five years’ time! That’s a great point and you’re right. They probably wouldn’t keep reinvesting into the same item. Instead, once they have enough dinner plates to stay in stock year-round, they will probably launch a second product. It may be another design or they might launch cups or some other kids’ eating accessories. What you must remember, is if you only have $10,000 to start with, you probably will need more stock than you can afford just to keep up with the demand for the item on Amazon, and that’s just in the U.S.
Rather than designing and launching a second product, Jake and Sally may decide to use their profits to launch the same dinner plate set in the U.K. market. This is really smart because it would require almost no new work. In short, there are several ways they might deploy their profits to grow. It depends on their niche, personal desires, and their specific goals. Warren Buffet is an investor but this is a business. How did you make that comparison? Here’s the thing about having an Amazon business. If you use Fulfillment by Amazon (where they handle the entire warehousing, shipping etc. ), then once you set it up, it acts far more like an investment than it does a business. I spend between 1-2 hours a week on my Amazon business, whereas even a passive investor probably reads for this amount of time, to stay abreast of what’s happening in the markets. They, too, have a lot of risk, so I personally feel you can compare owning an Amazon business to managing an investment portfolio. Is a 43% return high for Amazon? Amazon has always been the place to go for low prices and this continues to be the case, especially as more and more people are competing for the sale. Irrespective, in Primed I set out my counter-intuitive (yet, very logical) strategy of moving toward premium products and staying away from products where price is the main driver. Putting things in perspective though, even if you made only 20% return and rotated twice year, that’s a 40% annualized return. These kinds of returns put you way ahead of almost any other strategy for growing your wealth over time. I’m excited! I have $100,000 right now. Should I go “all in”, or should I do this gradually? My advice is always to go slowly. Money is very hard to make and very easy to lose. So let’s look at the real cost of testing the waters first. Instead of investing the whole $100,000 now, why don’t you start with $10,000 to see if you can get it back, plus your return (let’s say 30%). If this takes six months, then the worst case scenario is you now know how it works and you’ve proven to yourself you can do it. Now go up to $50,000 wait another six months, and repeat the process. If you do this twice, you really minimize your risk and you’ll feel better about making a bigger investment on your next order. In total, you may lose a year by going in slowly, but how long did it take you to get that $100,000 after tax? For most people this is a lot of money, so be careful until you know what you’re doing! My advice with Amazon is always this. This is not the kind of business you rush. Undertaking research, dealing with suppliers, getting samples, waiting for boats – all of this takes time. In the Jake and Sally story, Amazon gets $7.65 for every sale. That’s 34% of the retail price. This seems really high, doesn’t it? Businesses cost money, plain and simple. For this $7.65, which you didn’t have to risk upfront, you received an incredible amount of value. You got to use Amazon’s brand. That carries massive trust and value. You got to use their multi-billion dollar logistics infrastructure. You got to use their warehouse receiving staff to unload your truck and check your items into inventory. You got to use their staff to pick, pack, and send your order when a sale was made. You didn’t have to build the website. You didn’t have to do any advertising. You didn’t have to learn how to use Facebook or Google. You don’t have to handle returns. You didn’t have to go to the post office. You didn’t have to hire anyone. You didn’t have to provide insurance to cover warehouse employees. You didn’t have to train staff. Basically, Amazon lets you lease their whole infrastructure and all their people on a no-contract, performance-only basis – anywhere in the world where they do business. It’s an absolutely innovative offer. Can I spend less on logos, packaging and photography? Yes! There are millions of products on Amazon and it does not make sense to have premium design work done for all of them. What is important is that, unlike most Amazon sellers, you are prepared to invest money where it matters. Too many people go into business attempting to invest as little as possible because they think it’s reducing their risk. In my view, this thinking is profoundly flawed because it presupposes your customers won’t notice that you skimped on quality. This fundamental error in judgment may prove very expensive. In my experience, people are sick of low quality, cheap products that may have been misrepresented to the market. I think the riskiest thing you can do is assume your customer is stupid. This post was an excerpt from Primed: Your Guide To Building An Amazing Business On Amazon, available from Amazon.com and Amazon.co.uk as a paperback and for the Kindle. how do I get extra imcome to earn money from amazon online sells.